To reiterate, the following is not a complete character summary of Roderick Kingsley, but rather an overview of the events involving Roderick that directly affect (or were affected by) Norman Osborn. No Goblin successor has come closer to achieving Norman's initial plan of uniting the criminal underworld than Roderick Kingsley, the original Hobgoblin. However, the one quest that brought Kingsley into direct conflict with Norman and his family was Roderick's struggle to obtain the secrets behind the Goblin Formula. Kingsley's mission to duplicate the Goblin Formula, thus truly inherit the mantle of the Green Goblin, is the focus of this section. That 'dude' was Roderick Kingsley. After Georgie shows him the hideout, Roderick steals all of the technology, kills Georgie and burns down the hideout to leave no trail. 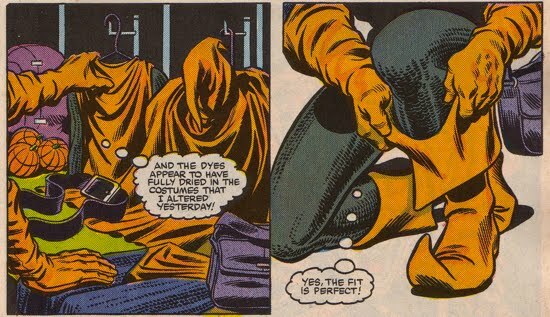 He re-designs the costumes and becomes the Hobgoblin. Spider-Man was aware that a fire occurred at a fomer Goblin Hideout. In Amazing Spider-Man #239, Roderick Kingsley (at the time of the story it was an unknown figure) is now raiding all of the Goblin hideouts and consolidating them into his control. He is also reading all of Norman’s journals as well. The Hobgoblin has his first contact with Spider-Man but he was easily defeated by the wall crawler. 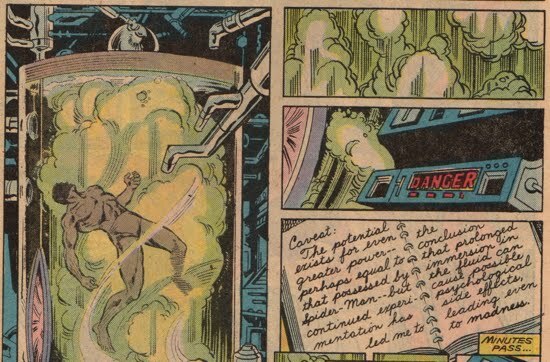 This issue also introduces Donald Menken, an employee of Osborn Industries. Donald would return in the Revenge of the Green Goblin series and demonstrate that he truly is a Norman Osborn loyalist. The Hobgoblin deduces that Norman must have had an edge in order to be able to compete with Spidey, and thus the quest for the Goblin Formula begins. 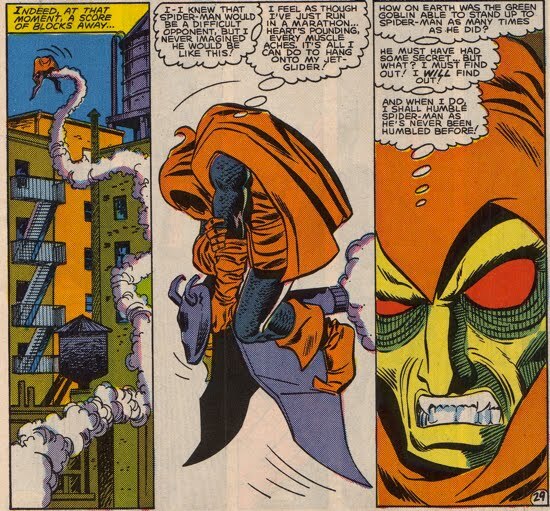 A man claiming to be following the notes of Norman Osborn attempts to recreate the Goblin Formula in Amazing Spider-Man #245. The formula turns green and explodes (as expected) and the man is rushed to the hospital. He is in a coma for three weeks and when he wakes up he escapes the hospital and goes to a Hobgoblin hideout. There he finds a Hobgoblin costume that appears to have been laid out for him. He puts on the costume and tracks down Spider-Man. 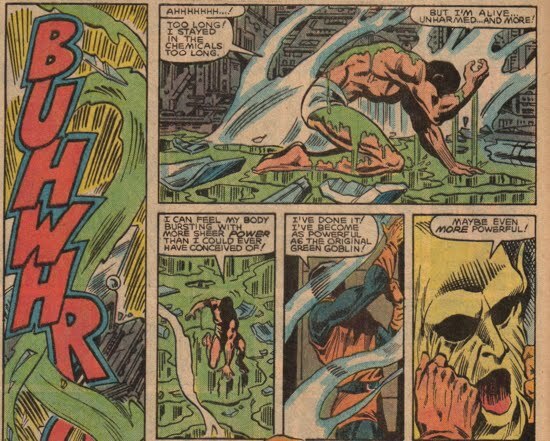 Spidey easily neutralizes him and unmasks him to see that it is Lefty Donovan. Spider-Man instantly believes Lefty to be an imposter. 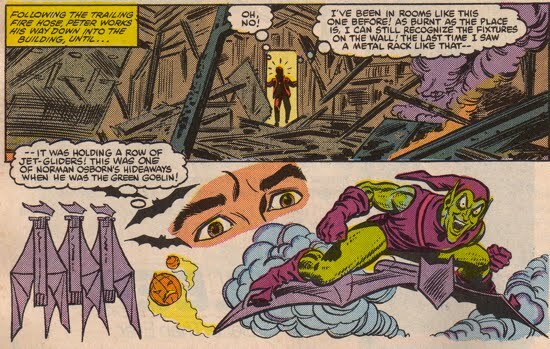 However, before Spidey could do anything the Goblin Glider goes on autopilot and sends Lefty crashing into a building. Donovan dies in the explosion and is later revealed to be a stooge set up by the actual Hobgoblin. Roderick used Lefty as a guinea pig to test the Goblin Formula. He was now poised to study the results from Donovan’s exposure so that he could duplicate the serum without the negative side effects. In Spectacular Spider-Man #85, Kingsley was ready to take the version of the Green Goblin formula that he had been modifying. Roderick's key innovation to the Goblin Formula-exposure was the mode he used to get the chemical into his body. 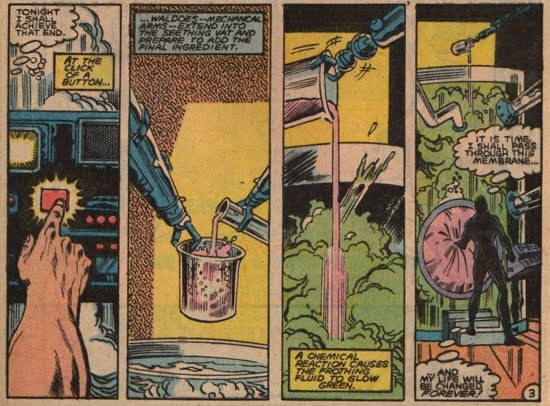 As opposed to having the formula explode on to him, he used a robot to mix the concoction into a giant vat. He then passed through a permeable membrane limiting the amount of exposure to the Formula. Unfortunately for Roderick he stayed in the membrane for a bit longer than he had hoped to, however he did manage to come out seemingly unharmed. After exposing himself to the formula, he's ready to test his newfound strength out. Kingsley targets Spider-Man and the Black Cat. 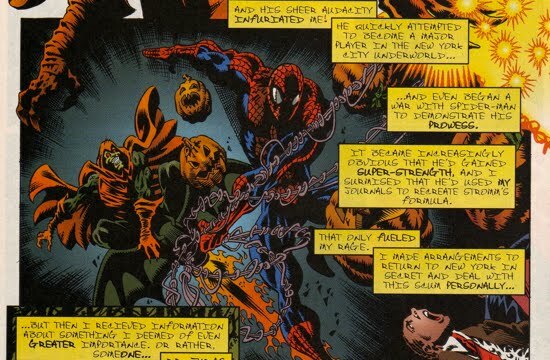 Both sides hold their own in the confrontation yet Spider-Man almost captures the Hobgoblin. Unfortunately the Black Cat, believing Spidey to be in trouble, screwed up the trap he had set for the Hobgoblin which allowed the villain to escape. In Amazing Spider-Man #249, Kingsley has the Goblin Formula in hand and he's ready to begin building his empire. The Hobgoblin begins blackmailing various prominent members of society and Harry Osborn is one of them. Harry receives an envelope that contains evidence that his father was the original Green Goblin. This sobering fact causes Harry to recall the memory that he had long forgotten, that his father is responsible for the death of Gwen Stacy. Interestingly J. Jonah Jameson is also being blackmailed because apparently he had told Norman Osborn of his attempts to take out Spider-Man using the Scorpion. Norman held that secret for potential future blackmailing and Roderick got his hands on it. 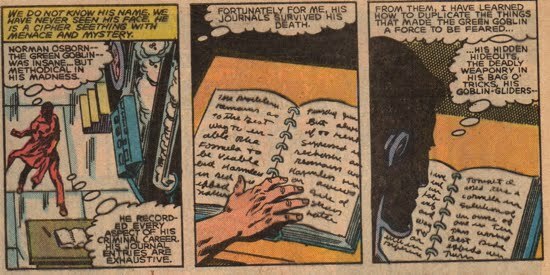 In Amazing Spider-Man #251 all of Norman’s journals (that Roderick was aware of) were destroyed in a fire during a battle with Spider-Man. 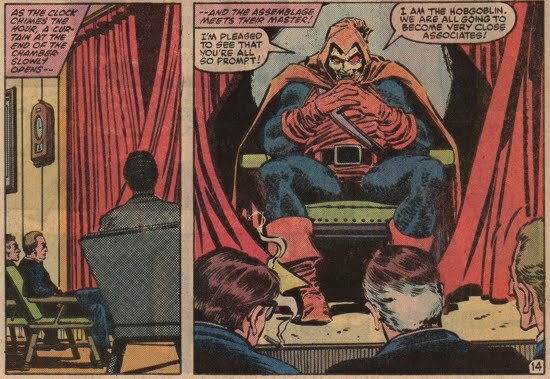 We also know from the Spider-Man: Hobgoblin Lives that Roderick gives up the Hobgoblin persona after the events of Amazing Spider-Man #251 when he realized that he was being trailed by reporter Ned Leeds. It was J. Jonah Jameson who had put Leeds on the tail of the Hobgoblin. Leeds was subsequently brainwashed by Roderick to play the role of the Hobgoblin, ultimately leading to him being framed as the Hobgoblin and then murdered. In one last attempt to obtain the secrets held within Norman's journals, the Hobgoblin resurfaces in Amazing Spider-Man #260-261. 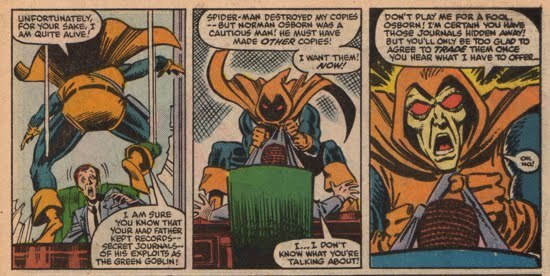 The Hobgoblin, now most likely the brainwashed Ned Leeds, attacks Harry Osborn at his office demanding he hand over copies (which must exist!) of Norman’s journals since the originals were destroyed. The Hobgoblin kidnaps MJ and Liz Allan to force Harry to be productive in finding them. Harry searches everywhere and almost comes up empty. However, in one of his father’s secret hiding places he finds a journal with a complete list of the Goblin hideouts. He trades it to the Hobgoblin, who accepts it reluctantly. A fight ensues involving Spider-Man, the Hobgoblin, and Harry who uses some Goblin weaponry. The Hobgoblin escapes and concludes that the journal he was given was completely useless to him because he had already raided those locations. He now considers himself on his own and no longer dependent upon Norman. 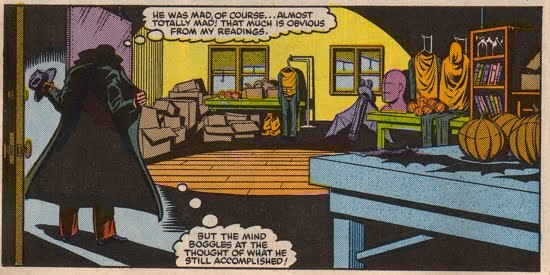 While exiled in Europe, Osborn was fully aware of Kingsley's exploits as the Hobgoblin, he even considering returning to eliminate the imposter. But Osborn decided not to respond, rather to wait for the more appropriate time to reveal himself to the public. When Norman returned from the "dead" at the conclusion of the Clone Saga, he slowly began rebuilding his empire through legitimate and illegitimate practices. This tactic inevitably sends Kingsley and Osborn on a collision course. Their first direct encounter is summarized here and is featured in a story arc entitled Goblins at the Gate. Norman and Roderick would come in contact once again during the Goblin Nation event, interestingly Osborn believes that he kills Roderick at that time. Roderick, of course, is alive and well living in Paris, France.